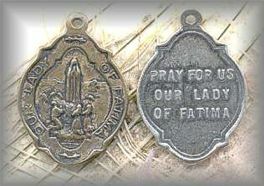 "M.OLF.03 - OUR LADY of FATIMA - vintage, unknown - (1 in.)" ||||| M.OLF.03-BOUR LADY OF FATIMA: A beautifully shaped Our Lady of Fatima with a reverse that says, 'Pray for us Our Lady of Fatima' Front image of Madonna with children. Traditional.